Global politics has changed with unaccustomed swiftness since the end of the Cold War. Eastern Europe is free; the Soviet Union has broken up; China presses free market economic reform; and the United States and Russia have declared a joint commitment to end nuclear war. The force of these changes has created a new agenda for global politics and security policy. This does not mean that nuclear weapons have lost their centrality. Nuclear development programs continue in the major holders of advanced weapons. In Israel, Pakistan, India, North Korea, Iraq, and Iran nuclear intentions are subject to widespread speculation and scrutiny. Negotiations for renewal of the Nuclear Non-Proliferation Treaty remind us that the treaty requires serious efforts to abolish nuclear weapons. Nuclear Choices points out that the Cold War's end has not banished mistrust. Instead, it has opened the door to frank conversation about the usefulness of force and the need to address common fears. States now face a global choice among alternative nuclear futures. If they desire to avoid runaway nuclear development, the choices come down to three: the status quo, disengagement, or abolition. Larkin argues that if they chose the status quo, they elect a world in which only terror and self-restraint keep devastation at bay, a world in which instant destruction is possible. 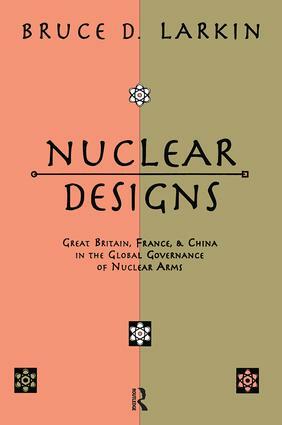 This study focuses on the nuclear weapons programs of Great Britain, China, and France, because they may be less familiar to students of international affairs. Each of these countries has developed a substantial nuclear capability that could decisively shape the result of coming global nuclear decisions. Larkin concludes that these three minipowers could conclude that nuclearism serves their interests, refuse disengagement, and encourage proliferation. If they are prepared to abandon nuclearism, they have tremendous political leverage on Russia, the United States, and also on undeclared and aspiring nuclear weapons states. For now, only the United Kingdom, France, and China maintain sufficient warhead inventories and production capabilities to have strong effects on how the United States and Russia view their own strategic capabilities. Nuclear Choices asserts that governments, polities, and parties today do not know how to guarantee themselves against weapons of mass destruction. They must either acquire the political and social means to achieve such guarantees or accept a world in which nuclearism will continue to cast its shadow over all aspects of nation building. It will be of interest to political scientists, policymakers, military analysts, and those interested hi the nuclear issue.